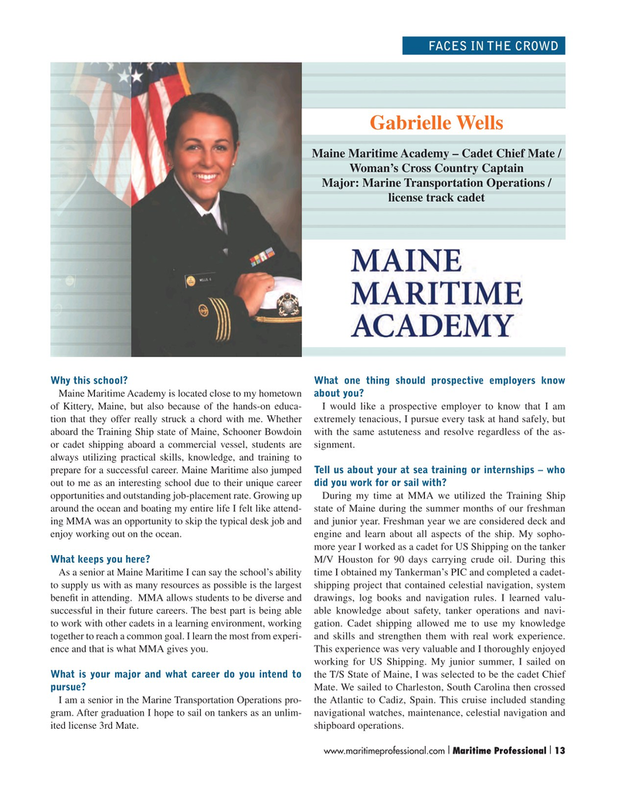 Maine Maritime Academy is located close to my hometown about you? of Kittery, Maine, but also because of the hands-on educa- I would like a prospective employer to know that I am tion that they offer really struck a chord with me. Whether extremely tenacious, I pursue every task at hand safely, but aboard the Training Ship state of Maine, Schooner Bowdoin with the same astuteness and resolve regardless of the as- or cadet shipping aboard a commercial vessel, students are signment. always utilizing practical skills, knowledge, and training to prepare for a successful career. Maine Maritime also jumped Tell us about your at sea training or internships – who out to me as an interesting school due to their unique career did you work for or sail with?